I was directed here by my HijackThis software. My laptop runs WinXP SP3 and has been running very slowly lately with the cursor disappearing every now and again, and 3-4 minute internet and Windows Explorer page and window loading times. Also, my Hotmail account was hacked and spam sent to my contact list. O4 - HKLM\..\Run: [SunJavaUpdateSched] "C:\Program Files\Java\jre1.5.0_22\bin\jusched.exe"
O4 - HKLM\..\Run: [HP Software Update] "c:\Program Files\Hewlett-Packard\HP Software Update\HPWuSchd.exe"
And here is the logfile from MalwareBytes - I've already deleted the 3 dodgy files that MWB found, and my internet appears to have speeded up a little. HKCU\SOFTWARE\Microsoft\Windows\CurrentVersion\Explorer\Advanced|StartMenuLogoff (PUM.Hijack.StartMenu) -> Bad: (1) Good: (0) -> No action taken. HKCU\SOFTWARE\Microsoft\Windows\CurrentVersion\Explorer\Advanced|Start_ShowHelp (PUM.Hijack.StartMenu) -> Bad: (0) Good: (1) -> No action taken. C:\Documents and Settings\gemma\Local Settings\Temp\regincd2.exe (Spyware.OnLineGames) -> No action taken. I should add that I use Avast Free antivirus software. If you are please follow the instructions in my previous post. If you still need help, follow the instructions I have given in my response. If you have since had your problem solved, we would appreciate you letting us know so we can close the topic. Please reply back telling us so. If you don't reply within 3-5 days the topic will need to be closed. This topic has been reopened per users request. Thanks for reopening this so quickly for me! My machine runs Windows XP Service Pack 3 x86 NTFS. I do not have the OS installation discs. There is a brief description of the problems I've been experiencing in post #1 of this thread. Also attached is the DDS attachment you requested above. mRun: [HP Software Update] "c:\program files\hewlett-packard\hp software update\HPWuSchd.exe"
mRun: [gcasServ] "c:\program files\microsoft antispyware\gcasServ.exe"
20:22:26.634 Disk 0 MBR has been saved successfully to "C:\Documents and Settings\Brid\Desktop\MBR.dat"
20:22:26.714 The log file has been saved successfully to "C:\Documents and Settings\Brid\Desktop\aswMBR.txt"
Please let me know if you need anything else from me. Please run the following tools and post there logs. Please download the TDSS Rootkit Removing Tool (TDSSKiller.exe) and save it to your Desktop. <-Important!!! Double-click on TDSSKiller.exe to run the tool for known TDSS variants. Vista/Windows 7 users right-click and select Run As Administrator. If TDSSKiller does not run, try renaming it. To do this, right-click on TDSSKiller.exe, select Rename and give it a random name with the .com file extension (i.e. 123abc.com). If you do not see the file extension, please refer to How to change the file extension. Click the Start Scan button. If the scan completes with nothing found, click Close to exit. If malicious objects are found, they will show in the Scan results - Select action for found objects and offer three options. Ensure Cure (default) is selected, then click Continue > Reboot now to finish the cleaning process. Note: If Cure is not an option, Skip instead, do not choose Delete unless instructed. A log file named TDSSKiller_version_date_time_log.txt (i.e. TDSSKiller.2.4.0.0_27.07.2010_09.o7.26_log.txt) will be created and saved to the root directory (usually Local Disk C .
Copy and paste the contents of that file in your next reply. This tool is not a toy. If used the wrong way you could trash your computer. Please use only under direction of a Helper. If you decide to do so anyway, please do not blame me or ComboFix. Download Combofix from any of the links below, and save it to your desktop. Close/disable all anti-virus and anti-malware programs so they do not interfere with the running of ComboFix. Refer to this page if you are not sure how. Close any open windows, including this one. If you did not have it installed, you will see the prompt below. Choose YES. should your computer have a problem after an attempted removal of malware. It is a simple procedure that will only take a few moments of your time. When finished, it will produce a report for you. Please post the contents of the log (C:\ComboFix.txt). Leave your computer alone while ComboFix is running. ComboFix will restart your computer if malware is found; allow it to do so. Note: Please Do NOT mouseclick combofix's window while its running because it may cause it to stall. How is your machine running now? Ok, I ran TDSSKiller - I've zipped and attached this log as it is a massive piece of text. It didn't give the 'cure' option you mentioned above, so I selected 'skip' per your instructions. 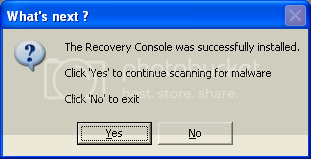 Combofix downloaded and installed Microsoft Windows Recovery Console, after which I left it scanning for 7 hours, without it completing the scan or producing a log. This despite me following your instructions to the letter, including disabling Avast Antivirus and not using the computer while the scan was in progress. I'm going to disable my screensaver and any power saving functions and try and run Combofix again. I also uninstalled any extra software that I don't use, like BitTorrent, Realplayer, etc. to see if this helped, but the machine is still running very slowly and freezes completely 3 or 4 times an hour. Google Chrome page loads can take 5-10 mins, ditto Windows Explorer windows and/or anything else I try to run on the machine.